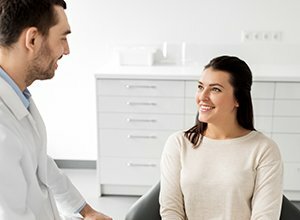 While root canal therapy may have earned an unfortunate reputation over the years, our dentists would like to be the first ones to let you know that in truth, it’s a highly successful and reliable procedure that hurts no more than a common filling. If you have a tooth that’s severely damaged or decayed to the point of being threatened with extraction, root canal therapy is often able to save it. If any of these symptoms are present, please call your Meriden dentist immediately. Not only is the wellbeing of your tooth in jeopardy, but your general health may be compromised, as well. Despite the fact that a root canal is no more bothersome than a filling, your Meriden dentist understands that this procedure can cause some patients to be quite anxious. Don’t hesitate to talk to your dentist or any member of our staff about sedation dentistry. We have various levels of sedation that will ease your worries so you can have the dental treatment you need. Once you are comfortable in the examination chair, the infected tooth and surrounding tissue will be anesthetized. Then, our team will remove infected tissue from the inside of the tooth and thoroughly clean and disinfect the area. The chamber and attached root canals are then filled with a biocompatible substance called gutta percha. This inert material expands to fill the hollow space and prevent recontamination as well as support the remaining tooth structure. Finally, the tooth will be sealed so that further infection is not a threat. In most cases, we will also place a new crown in order to restore any structure that was lost due to the decay. As long as they’re cared for properly from that point forward, many teeth that have undergone root canal treatment go on to last for a lifetime! If you have a toothache, don’t delay treatment. Root canal therapy is a painless alternative to tooth extraction. Contact the Meriden Dental Group and schedule an appointment.